The second annual Clusterfest will take place at the Civic Center Plaza and Bill Graham Civic Auditorium in San Francisco Friday and will feature Amy Schumer and Jon Stewart. 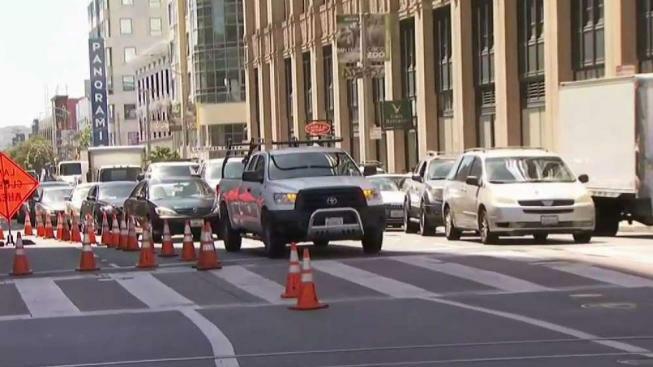 Some commuters might not be laughing if they get stuck in traffic during the 3-day comedy fest. Larkin, Polk, Fulton and Grove Streets are closed for the event and traffic will be diverted to Hayes Street. Drivers are already experiencing some backup traffic around noon Friday. Clusterfest is not only bringing famous comedians, but also performers like Third Eye Blind and Salt-N-Pepa. Other apperances include John Mulaney, Nick Kroll, the Wu-Tang Clan, T-Pain, Jeff Ross, Bianca Del Rio and Michael Rapaport. Attendees can also can also look forward to the live performance of the musical-comedy trio of Andy Samberg, Jorma Taccone, and Akiva Schaffer as The Lonely Island. Aside from the music and comedy, Clusterfest also features interactive attractions like a President Trump Twitter library, a South Park county fair and Nickelodeon’s Double Dare game.